German philanthropist; born at Berlin in the middle of the nineteenth century. 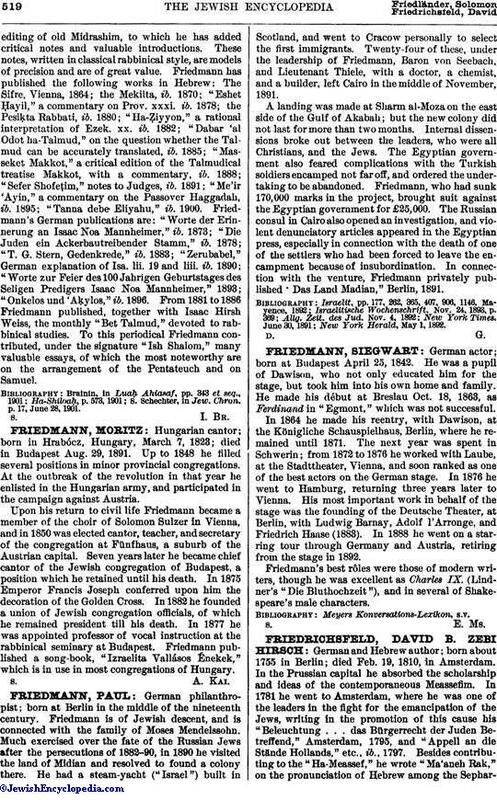 Friedmann is of Jewish descent, and is connected with the family of Moses Mendelssohn. Much exercised over the fate of the Russian Jews after the persecutions of 1882-90, in 1890 he visited the land of Midian and resolved to found a colony there. He had a steam-yacht ("Israel") built in Scotland, and went to Cracow personally to select the first immigrants. Twenty-four of these, under the leadership of Friedmann, Baron von Seebach, and Lieutenant Thiele, with a doctor, a chemist, and a builder, left Cairo in the middle of November, 1891. A landing was made at Sharm al-Moza on the east side of the Gulf of Akabah; but the new colony did not last for more than two months. Internal dissensions broke out between the leaders, who were all Christians, and the Jews. The Egyptian government also feared complications with the Turkish soldiers encamped not far off, and ordered the undertaking to be abandoned. Friedmann, who had sunk 170,000 marks in the project, brought suit against the Egyptian government for £25,000. The Russian consul in Cairo also opened an investigation, and violent denunciatory articles appeared in the Egyptian press, especially in connection with the death of one of the settlers who had been forced to leave the encampment because of insubordination. In connection with the venture, Friedmann privately published "Das Land Madian," Berlin, 1891. New York Herald, May 1, 1892.